Hunters Lodge Hotel is a Grade II listed building located close to the Scotland-England Border and the heart of the world-famous wedding location Grenta Green. We are the closest hotel to the Registration Office and to the stunning Anvil Hall wedding venue making us an ideal base for your Scottish wedding. The hotel has remained in the same family for 31 years so we take pride in everything we do to ensure that your stay with us is both memorable and enjoyable. The Hunters Lodge Hotel is also an ideal base to explore the area - from Hadrian's Wall, the English Lake District in Cumbria, Gretna Gateway or the Scottish Borders. It's also perfect for a quiet break away to relax and unwind. We very much look forward to welcoming you to The Hunters Lodge Hotel. Book your stay with us today. 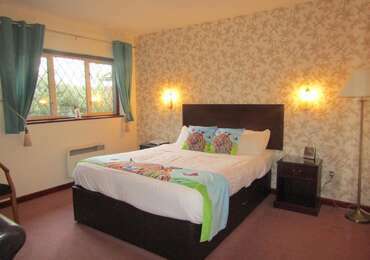 Relax in our family room with En-suite with bath (overhead shower). All rooms have bedside tables, wardrobe & drawer space, desk/dressing table for ease of work, with freeWi-Fi access, iron & ironing board (available upon request), and tea/coffee making facilities in all the rooms. 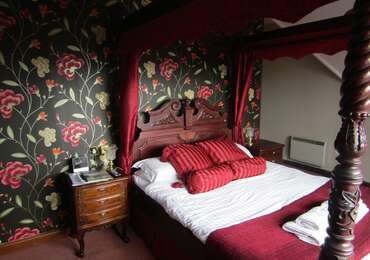 This room has a king size 4 poster bed & single bedand located within the main building accessible by stairs. 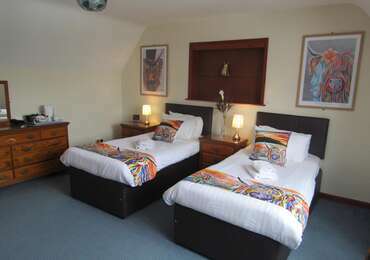 Relax in our modern Twin Room with En-suite bath with overhead shower. All rooms have bedside tables, wardrobe and drawer space, desk/dressing table for ease of work, with freeWi-Fi access, iron & ironing board (available upon request), and tea/coffee making facilities in all the rooms. This room has 2 single beds and is accessible by stairs.